Phoenix Suns – Artworks PHX – a business-arts campaign in Phoenix, Arizona USA. 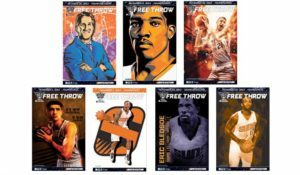 Phoenix Suns spotlight artists on Free Throw game program front covers. When fans attend a Phoenix Suns game, they’re going to see more than great basketball action. They’ll also get exposure to incredible local art thanks to an innovative initiative that puts fans’ art on the cover of each game program. Featured artists receive two tickets to the game so they can see their artwork in the hands of thousands of Phoenix Suns fans. And they get even more than their 15 minutes when the Suns draw attention to the art through social media channels. In addition to this innovative Free Throw game program arts initiative, Phoenix Suns Charities has also been a longtime supporter of programs that bring arts into Arizona schools.